According to me Rakesh Jhunjhunwala is physiological genius, a man with vision and great understating about stock market. 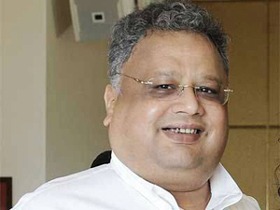 Today rakesh jhunjhunwala has many fans and followers. These followers often look for rakesh jhunjhunwala portfolio. In order to help them I am herewith Rakesh Jhunjhunwala latest portfolio 2014 & Tips. Don’t Look for Profits; Look For Sources Of Profits. Forget ‘Large Cap, Small Cap’ Nonsense – Look For Scalability of Operations. Give it Time, Be Patient. Invest in a business that you can understand. Don’t get carried away by short-term aberrations. Don’t worry about the macro stuff like fiscal deficit, inflation etc which are unknowable. Focus on what is knowable. If it’s cheap, buy it- Don’t pass up something cheap today in the hope that it will get cheaper tomorrow. Don’t buy stocks that have a fixed return. 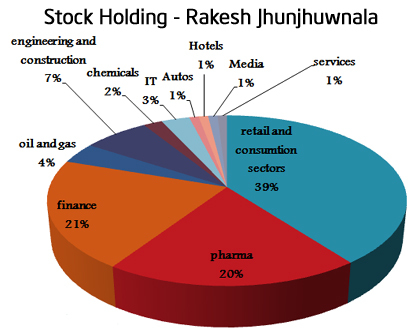 Rakesh Jhunjhunwala partial portfolio is worth Rs. 4361 Cr as on 1st April 2014. Major stock hold by Jhunjhunwala is Lupin and Titan. If you like this post, don’t forget to give us Facebook Like! i would like to invest some good shares for long time.please suggest…. I like it Rakesh jhunjhunwala in Very Big inwester. I would like to invest in some good shares for long time and short term. Please suggest.